Are we trying too hard to give our children the things we never had? My grandchildren call them OPPs – Over Protective Parents, the ones who are terrified of their children getting hurt. Read more: Are you over-parenting your child? The other day I heard the term “lawnmower parent”. Lawnmower parents flatten the path for the child, so the child never experiences any hardship. 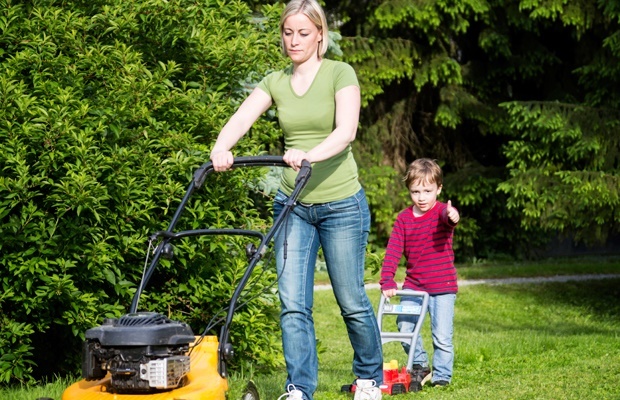 A lawnmower parent controls a child’s destiny so that everything is flat and easy, thus creating an environment that could raise a generation of “brats”. Does your child have any chores to do around the house? Has your child ever grown anything, be it a few radishes or petunias? Is your child aware of the financial situation of the family? Do you give your child pocket money or does he/she have to earn it? Do you help your child with their homework and projects? Does your child have a pet that he/she takes complete responsibility for? Feeding, grooming, cleaning of cage/tank? Have you ever said these words to your child, “I am sorry but we can’t afford one of those in this house”? If your child is over 12, do they have a means of earning money for things they want/need? When your child finishes school, if he/she wants to study further, will he/she seek casual employment to pay for clothing and entertainment? When your child finishes studying, is he/she going to contribute towards the family finances by paying board and lodging? There are no right or wrong answers to these questions. They are simply there to get you thinking whether you are perhaps making life too easy for your child. People of my generation tend to say, “Children today have everything.” They don’t have everything. There are children living in shacks doing their homework at night by the light of candles. And there are also children who know that when they finish school they will take a gap year and Daddy will buy them a car, unless of course they want to go and kick around Europe for a while. Maybe the principle of compensation comes in here. Are we perhaps trying too hard to give our children the things that we never had? Well, that’s not possible because the things they have now didn’t exist in our day. We, as adults, are also having things that our parents never had, like dishwashers and jacuzzis and double garages for the two family cars. Whether those things are making us any happier is debatable. But that is not the question here. The question is whether we are making it all too easy for our children by doing too much for them instead of making them take responsibility. I watched two children grow up from babyhood and if there were ever two pampered darlings these two were. Their father was making big bucks and he believed that whatever these two wanted they must have. One day the bubble burst, his business collapsed and the money was barely enough to provide necessities, never mind the very latest Harry Potter book. I believe that this was the best thing that ever happened to those two children. It may have been a culture shock for them to hear the words, “That’s not something we can afford,” and, “I am afraid you will have to give up your karate lessons,” but suddenly, oh boy, they learned to appreciate. And they learned that there is a way to get the things in life one wants and that is to work for them. The one teenager took a part-time job in a pet shop and his sister started a home industry baking cookies. So if a few weeds pop up in your children’s path, it’s not necessary to rush to pull the weeds out. Give the children a chance to deal with them. They may need your help but then, on the other hand, they may surprise you with the way they handle problems. After all children learn by example and they have been watching you while you did it all for them.